Farmers who are considering the purchase of an irrigation system for their vegetables or small fruits must consider many factors including: soil type, drainage, erosion, location of power sources, water availability, crop requirements, yield potential, frost protection, labor requirements and availability and installation and operating costs. Here is a sample of some of the most common irrigation systems for small fruits and vegetables. This system involves the setup of aluminum pipe to distribute water from the source to the field. One main line stretches out across the field with a series of lateral pipes that are moved to irrigate the field in sections. The major advantage of this system is that total system capital cost is relatively inexpensive. The primary drawback is that it is a very labor-intensive irrigation system. With this system, the entire field is covered with laterals that are set in the field for the entire growing season. The major advantages of this type of system are its suitability for frost protection, its ease of operation (because pipes are not moved once they are set in the field and individual lateral lines can be controlled by the header valves), and relatively low labor requirements. The major disadvantages are that it is a very capital-intensive system, and the presence of the pipes can impede certain field operations such as spraying, cultivation and harvest. This system is similar to the hand-moved sprinkler system, except that a dozen or more small, low-volume sprinklers are replaced with one or two high-volume big gun sprinklers. The big guns cover more ground with less labor. The advantage of this system is large areas can be irrigated fairly quickly. The disadvantages are it is labor intensive to set up and operate, produces a large droplet size that may injure tender crops, and causes adverse wind effects on water distribution patterns due to its high-stream trajectory. Consists of a big gun sprinkler mounted on a wheeled cart connected to a hard plastic hose on a mechanical reel. 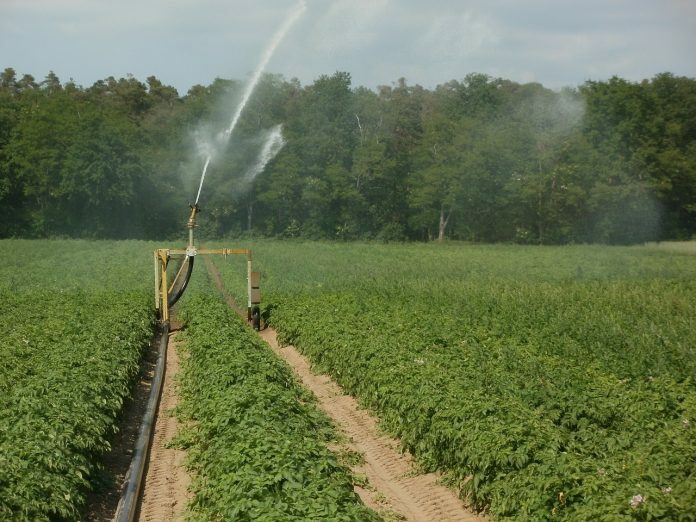 These systems are used by growers to irrigate large acreages with relatively little hand labor. Advantages include: less labor to set up and operate, improved water distribution, irrigates more acreage with less labor and adaptable to almost any shape, size and contour of the field. Disadvantages: high capital costs and high operating costs, unsuitable for frost protection, large droplets can injure tender crops, adverse effect of wind on water distribution and potential for runoff and erosion. A moving irrigation pipeline, where water is distributed along the length of the pipe, which pivots around a central, fixed water supply. These are suited for fields with a single crop. The cost to install is high. Advantages: Little labor is needed after setup, medium operating pressure saves energy, can apply small amounts of water frequently, covers large areas and water covers uniformly and has good adaptability to fertigation. Trickle irrigation, also referred to as drip irrigation, applies water to only the soil. This type of irrigation is most often delivered via a tube that runs the length of the row. Advantages: more efficient water usage (water applied directly to soil), adaptability for fertigation, reduced disease problems because leaves are not wetted, low energy requirements and low labor requirements. Disadvantages: Freezing can cause blocked emitters and broken lines and connectors, not suitable for frost protection. Next week: Other tips and considerations for irrigation systems. Source: Irrigation for Fruit and Vegetable Production, Penn State Extension. What can you burn on the farm?